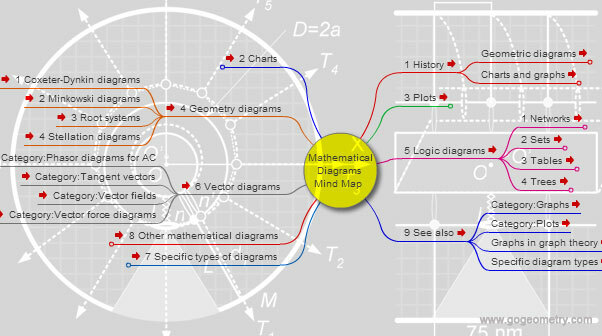 Mathematical Diagrams Interactive Mind Map, Education. Instructions To link: click a red arrow. To Fold/Unfold: click a branch. To see a note: Hover over a yellow note button. To Pan: click and drag the map canvas. Interactive Mind Map that represents connections between various topics and concepts related to Mathematical Diagram. Source: Wikipedia: Mathematical Diagram. Mathematic diagrams are diagrams in the field of mathematics, and diagrams using mathematics such as charts and graphs, that are mainly designed to convey mathematical relationships.